If we are going to talk about turn-of-the-century Christian literature and the development of a Christian self-identity, then we are going to have to be ready to face anti-Semitism. It infuses this literature. It is explicit as well as implicit. This is a topic that is difficult to broach because we are talking about hatred that, when mobilized by those in power, leads to terror, violence, and death. It is very tough to look at this literature and not feel shame and guilt. What I think has been happening in scholarship as a way to dampen this shame and guilt in post WWII modernity is a reenvisioning of the conflict between the Jews and the Christians in this period as an intra-Jewish conflict. 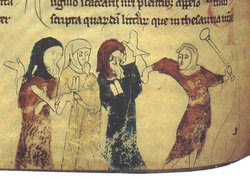 In my opinion, this revision of history (whether intentional or unintentional) serves to soften the shame and guilt by suggesting, however subtly, that Christianity is not guilty of originating anti-Semitism because 1) Christianity didn't really exist yet and 2) the conflict was a conflict that arose among Jewish brothers and sisters. The desire to revise the history of Judas is part of this scholarly trajectory (whether intentional or unintentional), either wishing Judas away or wanting him to be a hero that later traditions demonized. All of this effectively works toward exonerating the earliest Christians, so that the Christian tradition is not inherently at fault for anti-Semitism (and therefore we don't need to change anything essential to Christianity today), and so we can return to being brothers and sisters as we were before the conflict arose. There are many things about this revision of history that I am uncomfortable with, especially the argument that anti-Semitism arose as an intra-Jewish conflict, which effectively ends up shifting the blame for the origin of anti-Semitism on Judaism rather than Christianity (although I don't think that this was the intention of the academic argument). So in my posts when I discuss the separation of Christianity and Judaism, I will be addressing this issue openly. It is correct that Christianity is a Jewish movement during this period, BUT it also is a movement that is taking on a self-identity that is beginning to define itself against Judaism or superior to Judaism. So when the Christian tradition was forming as its own unique religion (when it was identifying itself as something other than Jewish), it generally did so by defining itself over and/or against Judaism rather than in continuity with it. Even its attempt to keep the Jewish scriptures was done in terms of superiority, the Jewish scriptures become the "old" covenant superseded by the "new." The Jewish ways of interpreting their scriptures were discarded as foolish and ignorant, while the Christian way was understood to be God-inspired. This process of self-identification occurred gradually and at different times for different Christian populations and some groups chose to keep closer ties to Jewish traditions than others did. Anti-Semitism originated within this environment. It is at the core of the original process of Christian self-definition. What this means for Christianity today and in the future is something that I think the churches still need to address, especially since the anti-Semitism that was the consequence of early Christian self-definition became part of the Christian scripture when texts like the Gospel of John were canonized. This is an interesting change for Christianity, given that Jesus started out anti-Gentile. He commanded his disciples to not preach to the Gentiles, but only the tribes of Israel. And when approached by a Canaanite woman to heal her daughter, Jesus responded that the "dogs" did not eat off the Master's table - basically calling Canaanites and other Gentiles "dogs" which is still used in the Middle East as an epithet. Interesting to see how the Christian Church changed from anti-Gentile to anti-Semitic in so few short years. Constantin Brunner writes that John and other Jews "had become such fervent Christians in their enthusiasm for the new knowledge that they had to demonstrate a commensurate hatred for the other Jews and their Judaism" (Our Christ, p. 441). Of course, it was later Gentile Christians who took this to the ultimate extreme of murderous hate. I certainly agree that it is wrong to turn the anti-Jewish sentiments in the early Jesus movement into an intra-Jewish conflict. I also agree that this movement as it developed into Christianity was defining itself against Judaism and distorting the real nature of Judaism as it did so. Not enough has been said about how the early Christians feared Judaism as competition because gentiles/pagans were very attracted to Judaism — an attraction that Christianity benefited from. However, it also has to be said that there is still an anti-Jewish sentiment in scholarship today that projects too much anti-Jewishness into the Gospels. Modern scholars then blame the Gospel writers as a way of covering up their own scholarly faults. The major fear that still affects modern scholarship is that if Jesus turns out to be too Jewish, this will somehow harm Christianity or even end it. I am pretty sure this will not happen, but the fear is very real and it affects the way the evidence is distorted. 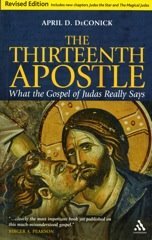 There are a lot of pro-Jewish elements in the Gospels which regularly get ignored because of this tendency to import too much anti-Jewishness into the Gospels. There are some very negative and hostile things about Jews in the Gospels but they are few and far between and we have used them to unfairly color the rest of the evidence which is often either neutral or actually positive regarding Jews and Judaism. What is really needed is an open and fair discussion of how a fear of Jesus' full Jewishness biases the way the Gospel evidence is discussed. "I certainly agree that it is wrong to turn the anti-Jewish sentiments in the early Jesus movement into an intra-Jewish conflict." There was conflict between prophets and priests. So much so, that the priests were killing the prophets, e.g. Ananus killed James. I believe this particular conflict had a close relation with the fabricated Judas and Jesus. "This is an interesting change for Christianity, given that Jesus started out anti-Gentile." So why did Jesus apparently go to Gentile areas; Galilee, Capernaum, and the Decapolis, for example. Capernaum was where he supposedly spoke with the centurion's servant who was said to have exhibited a faith not found in Israel. Jesus' Gentile mission was created. Jesus went to those areas primarily because there were Jews or Samaritans (whom he considered of the house of Israel) in those locations. Jesus still responded to an individual's faith, as he did with the Canaanite woman who wished her daughter healed. But that did not keep him from calling her and her ethnic group "dogs." Remember, it was the writer of Matthew who put those words into Jesus' mouth, of it not being fair to take bread from the children (of Israel) and throw it to the dogs. The same writer who spoke of gentiles as being in the same despised category as tax collectors, and that Jesus was sent not to the gentiles but only to the Jews. The writer knows of the opposition to Gentiles within Judaism. Of course Jesus had to be created supposedly despising Gentiles. But he is made to say to the Canaanite woman, "your request is granted", which sort of makes nonsense of his "I was only sent to the lost sheep of the house of Israel". The writer's purpose in this passage was to 'open the door' to Gentiles. 'revolt'. This was anti-jewish polemic. "When the chief priests and the Pharisees heard Jesus' parables, they knew he was talking about them." These were representative of Jews in general. "Therefore the kingdom of God will be taken away from you and given to a people who will produce its fruit" The 'people' were Gentiles. One needs to discen between which words were placed into Jesus' mouth, and which came through more or less intact. No problem Jim. All the words placed into Jesus' mouth must have been put there, because Jesus never existed. There's no getting away from the fact that the words attributed to Jesus are geared for Gentiles. Judaism is to be avoided. "Woe to you teachers of the law and Pharisees you hypocrites! You travel over land and see to win a single convert, and when he becomes one, you make him twice as much a son of hell as you are." The Pharisees were in effect the rabbis. But the Christians did something similar. They invented Paul who went on his travels in a mission to Gentiles. Whereas, the pauline epistles were edited versions of prophetic documents written from Rome. How do you know which words of 'Jesus' have come through intact? It seems to me that there was a prophetic movement that began to draw priests away from animal sacrifice. The Gospel of Mark gives some clues. First, it's not your place to decide if "we" need to change anything at all about Christianity. You're not part of any "we" that has a say, you're shouting arrogant demands from the outside. Second, if you think locating the origin of anti-Semitism (as you consider it) within Judaism is unconscionable and offensive, then you have very limited options. Either abandon your argument here by reconsidering the meaning of anti-Semitism, especially as applied anachronistically to the ancient world, suppress the Old Testament (which has many "anti-Semitic" passages far harsher than anything in the New), or else retreat entirely to an appeal to emotion and yell about the Holocaust. I was once "inside". You are yelling yourself. What do the academics say was the "intra-Jewish conflict", anybody? As I've studied the issue, including the Dead Sea Scrolls (another Jewish sect in the time of Jesus), we see sects fighting one with another, not against Judaism. I do not see an anti-Semitism, but rather a political infighting. Richard Friedman's "Who Wrote the Bible" shows clearly such infighting in the OT, while Bart Ehrman's books show it among the early Christians. This is a fight for dominance in religion and politics. Jesus is a religious leader/prophet, who preaches against the Pharisees, Sadduccees, and scribes, because they are not following His version of Judaism. And they attack him, not because he is Christian, but because he is leading converts away from their sects. Only in Paul's time and after does Christianity become a distinct religion, apart from Judaism. Some Gnostic sects rejected the OT writings, believing they were part and parcel of an evil God in the Garden; and that Jesus/YHWH had to save us from that evil God (El). While we cannot know for sure just which things Jesus (or Paul, etc) said, we can review the literature and see what his later followers thought he said. We can consider which were likely statements by him. For example, he would likely speak out against other Jewish sects, but not against Judaism itself. So, he does not come to destroy the Mosaic Law, but to fulfill it. And in Mosaic fashion, he holds Gentiles out at arm's length, knowing it is a sin to marry them. However, he does not necessarily go to the length of other Jewish sects in refusing to dine with Gentiles. He attacks the Sadduccees on resurrection, and the Pharisees on their use of the law (swallowing camels, straining at gnats). He accepts Samaritans as Jews, albeit a Jewish group that does not know God like they should. I believe these are likely views that Jesus held. Whether he viewed himself as Messiah, the Great Angel YHWH, God in Trinity, or just a prophet, we cannot really tell from the varying gospel accounts. I thing what's worth mentioning here that has not already been mentioned is the harsh anti-Christianism (if I can, I think, coin the term) demonstrated in early Judaism during this period, which was opposite and equal Christian "anti-Semitism" (not quite the correct word for a number of reasons, but I'll roll with it). I think the claims of some early Christians, like Sts. Justin the Philosopher and Irenaeus of Lyons, that the Jews were editing Scripture to make the Christian position look less tenable is a plausible claim in light of what we know about why Jews chose the Masoretic (or something like it) over the Septuagint at this time. There are also some rather disgusting passages from the Talmud which picture the Virgin Mary receiving several sexual-oriented punishments in the afterlife and, of course, quite a few which defame Christ and his Apostles. The Christians, in the end, are the ones who came to have enough power to put what was (mostly) otherwise a war of words into actions. Even this, though, didn't come in any major form until the middle of the Middle Ages (circa 1000 AD). There were restrictions on Jewish activity up until that point (could not own Christian slaves, could not enter Jerusalem but once a year, etc.) but no major persecutions, and a great many of these restrictions on Jews were holdovers from pagan Rome, not innovations of Christian Rome. The anti-Semitism that led to the Holocaust (for instance) did not come until much later and was only introduced within perverted forms of Western Christianity like Roman Catholicism and Protestantism. The Traditional Christians of the East have, unfortunately, had their turns with anti-Semitism (such as the pogroms in late Czarist Russia) but most of these were as a result of Western influence and there has been no such thing as a widespread, systematic persecution. The Ethiopian Orthodox Church is actually a great example of living Jewish Christianity, as the people of this blessed land converted from Judaism to Christianity in the early Middle Ages and continue to maintain many Jewish cultural and spiritual Traditions, including Sabbath observance, circumcision, and kosher dietary laws. In the end, your apparent assertion that Christianity is inherently anti-Semitic from its inception is more than a little off the mark and based entirely on Western bias. I have been enjoying reading your blog, but I must recommend that if you are going to continue featuring Orthodox iconography in these posts, I would appreciate it if you would take the time to be more inclusive of the Eastern Churches in your text and not make such general comments as these. Otherwise, it's inappropriately associating us with things with which we have had no interaction; and that's just plain offensive. So having left now puts you in charge? Are you replying here to me? If so, I'm not sure what you mean; could you please explain? Can we please get back to a civil discussion? We do not have to agree with one another's viewpoints, but we do need to be agreeable in disagreeing. After all, this is April's blog, not ours. Let's show some dignity, so that she'll continue to grace us with her knowledge, reasoning, and research. The hypothesis of anti-Semitism/Judeophobia as phenomenon extending back to the Second Temple period and lasting until the present day is questionable to the say the least. I discuss the problem of popular understanding of Jewish history in Jewish History: Facts Versus Delusions. Be sure to check out the comments.